St. Louisan William Gass--essayist, novelist, literary critic, and National Book Critics Circle Award winner--discusses his long-awaited novel, Middle C. It begins in Austria in 1938, as Joseph Skizzen's father, pretending to be Jewish, takes his family to England, before he disappears under mysterious circumstances. Relocated to a small town in Ohio, Joseph grows up and creates a fantasy self with a fantasy goal: to establish the Inhumanity Museum. William H. Gass is currently considered a "single author." If one or more works are by a distinct, homonymous authors, go ahead and split the author. 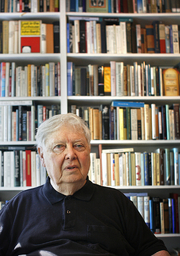 William H. Gass is composed of 11 names. You can examine and separate out names.